I Never Could Have Imagined! It all started with a small green book that I put together at one of the lowest points of my priesthood. I was very distressed and did not know where to turn. I decided to do something positive rather than wallow in misery. I put together a little book and sent a free copy to every bishop in the United States. It was the beginning of something I never could have imagined - invitations to speak to bishops and priests now totaling eight countries. That little book has now been translated from English into Spanish, Swahili and soon Vietnamese. The invitations are still coming. Free copies of this book were sent to all the bishops of the United States, Canada, England, Ireland, Wales, South Africa and Australia - as well as a few to various other countries. Addressing the Antilles Episcopal Conference in Port of Prince, Trinidad, earlier this year. I am in Barbados this week and I am now booking into 2018. I hope my health holds up to keep going. "Managing Change Successfully: An Exodus Spirituality for Priests"
Where the Davenport Presbyterate and Father Knott meet! Doing my thing in Davenport. Bishop Amos (on left) at break time. Get 'em while they are hot! Looking over my books for possible purchase. What's a hard day of ongoing formation without cocktails at 5:00? On the right are Fathers Adams, Father Adams and Father Adams. They are all priests and blood brothers. 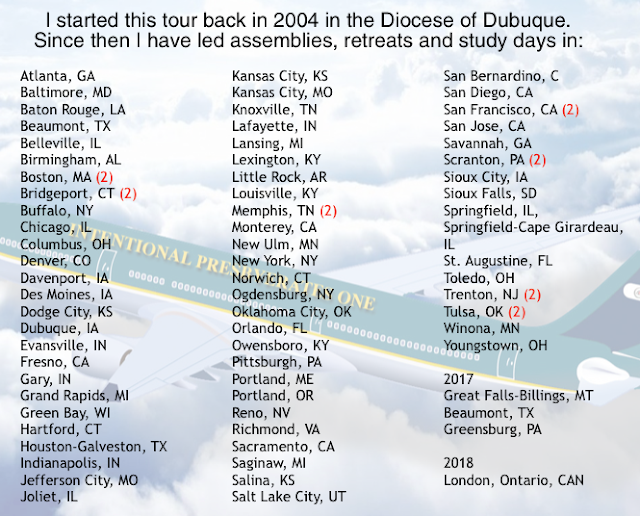 Father Ron Hodges (formerly Father Gabriel Hodges OSB) helped me found the Institute for Priests and Presbyterates when we were both there. Here he is holding a copy of the cookbook that we published after he left. It was something that we talked about for a long time. Even some priests text during dinner! Somebody tell him to put it away! Even the Davenport Presbyterate is internationalized! This priest is from Ghana. I wrote his name down and lost the paper! IS NOT ALL FUN AND GAMES! I do about 15 priest retreats a year to raise money for my projects down in the Caribbean missions - mostly in Canada and the United States. I did six - just since September - with two more to go before Thanksgiving. It is very rewarding on one hand and grueling on the other. I thought I would share one of the worst recent experiences - the trip home from the Ottawa, Canada. It is almost hilarious, after the fact! Here is the report in my journal the morning I got home. I wanted to document every bloody detail. I got to the Ottawa airport about noon - 3 hours early. I was warned that "international flights take longer." It only took 15 minutes to go through US customs in Ottawa so I settled in to endure what I thought would be about five hours of waiting in the Ottawa airport, one fourth the size of Louisville's. As the time of departure got close, my flight kept being delayed on the monitor. Finally, it was obvious I was going to miss my connection in Chicago. At the ticket counter, I got my ticket changed to a new ticket on the last flight out of Chicago to Louisville that night with a good connection time. When we were about to board from Ottawa to Chicago, we were delayed for about forty-five minutes because the gate for our incoming plane was still occupied. It started snowing. After waiting almost an hour, they changed the gate number, so we all moved to another gate and waited some more. Just as we were about board, we were told that "pilot visibility in the snow storm was not good enough so the flight may have to be cancelled." We all lined up again to change our tickets - yet again. I got a backup reservation from Chicago to Louisville for the next morning just in case. Just as the agent finished making that change for me, they announced that we would fly to Chicago that night after all. We finally boarded and the plane started for the runway, still snowing, only to be directed back to the terminal for de-icing. The de-icing took forever and just as they finished, something jammed on the de-icer truck and they had to call mechanics to pull the de-icer truck off the airplane. That took what seemed forever. The time to make my new connection in Chicago started running out again. By this time, I was convinced that I would be in Chicago overnight, if I could only get out of Ottawa. We did eventually take off in a blinding snow storm, however. Once in the air, the pilot told us he would "try to make up some lost time." We landed in Chicago with barely enough time for me to make my second attempt at a connection. The flight attendant had confided in me that “it would probably be OK because we would land at terminal F and that the Louisville flight usually left from terminal F."
Just as we got ready to pull into our gate to de-plane, we were held up yet again because another plane had not left the gate we were scheduled to enter. By then, time was running out for sure. I was convinced that I was certainly going to miss my flight. Finally, I got off the plane, checked a monitor and, to my horror, noticed that the Louisville plane was not leaving from terminal F after all. It was leaving from terminal C. Had she lied just to make me feel good? I ran like a bat out of hell with a heavy backpack on my back through two terminals to Gate 4 in terminal C. When I got there, the door to the airplane was closed and the plane was already loaded. I panicked and asked the agent at the next gate if she could call them and ask if they would open the door to let me on - something they never do - pointing out that I had exactly one minute to spare according to my ticket. Just then the door to the Louisville gate opened and an agent for the Louisville flight told me that they were waiting for me and that she had just closed the door to go see about something on the plane. She apologized and kept telling me to breathe! She led me on the plane personally, stuck her head into the cockpit and told the pilot he could now fly. I was the very last one to board. They closed the door behind me. Everyone was glaring at me for being late. I fell into my seat (the very back seat on the plane) breathing like I had run a marathon. We mysteriously got to Louisville 20 minutes early which sounded great until we were told by the pilot that another plane was at our gate so we would have to sit on the tarmac until it was pulled back. (This was the third time this had happened on this trip.) By then, we were a few minutes late rather than twenty minutes early. I got home a little after midnight after being totally stressed out for twelve straight hours! Air travel is not the exotic experience it used to be! I wish they would put something in those oxygen masks that would put you to sleep as you fly. If not that, maybe some "laughing gas?" 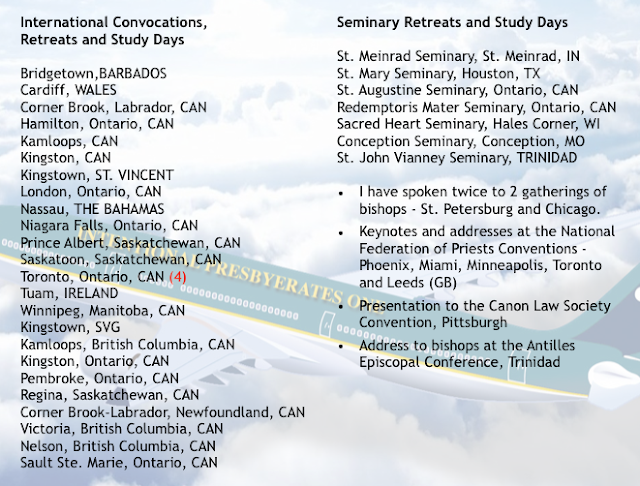 I am already beginning to dread the flight from Louisville to Miami to Barbados for their mid-November priest retreat. The flight leaves Louisville about 5:30 am. There is only a forty-nine minute layover in Miami. If anything at all goes wrong, I will be stuck in Miami for seven hours at least - all day and overnight if I cannot get on the next flight that night! Sometimes I ask myself why I didn't learn to play golf, move to Florida and act like a real retired priest!! !